With all the hoopla in the news about government shutdowns, debt ceilings, and steeply rising insurance premiums (I definitely got sticker shock when the letter came from Blue Cross this week), it’s nice to be able to immerse yourself in some material that will still be the subject of discussion in a century or two. Thus I give you the Great Books. As you can probably tell, we are going to continue through the rest of the Oresteia while we are on a roll. I know that means many weeks in a row where we will have read plays, but let’s enjoy it while we have an opportunity. 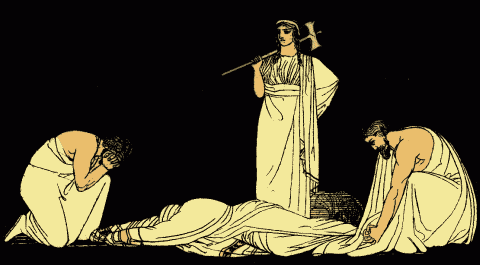 Agamemnon by Aeschylus: More impossible dilemmas confront Greek tragic characters. If Agamemnon sacrifices his daughter, he’s a murderer and an awful father to boot. If he doesn’t, the will of Zeus goes unheeded and legions of soldiers will sit around and cause trouble in the absence of a favorable wind. Agamemnon might deserve what he gets at his wife’s hands, but Cassandra certainly doesn’t. An Inquiry into the Nature and Causes of the Wealth of Nations by Adam Smith, Book IV, Chapters 1-3: In this section we finally arrive at what is probably the most famous quotation in the whole work: “By directing that industry in such a manner as its produce may be of the greatest value, [the businessman] intends only his own gain, and he is in this, as in many other cases, led by an invisible hand to promote an end which was no part of his intention.” I had never fully realized before that most commentators on Smith take this quote out of context and apply it to Smith’s view on domestic regulation. However, here he’s writing of foreign trade and the natural tendency to keep capital close to home whenever possible. The Descent of Man by Charles Darwin, Chapters 3-4: The focus of these chapters is the relative intelligence of humans and animals. Darwin’s thesis essentially is that although there is a huge gulf between the intelligence of a human and that of an ape (or between the intelligence of an ape and that of a fish), the difference is one of degree only, not of kind. He argues that many actions attributed to animals’ instinct is actually the result of intelligence. An Essay Concerning Human Understanding by John Locke, Book III, Chapters 7-11: These chapters continue the discussion about the significance of words. I remember reading in graduate school that philosophers of the late 17th century were really preoccupied with the idea that if everyone would just agree on the definitions of terms and speak with precision, most social disagreements would go away. Locke certainly confirms that generalization. He goes on at great length on the dangers of imprecise language and the problem of equivocation. My posting in the near future is uncertain. My wife’s due date is October 14, and I am having surgery on October 17, so there will be much excitement at my house. I’ll do my best to keep the ball rolling here. This entry was posted in Books, Liberal Arts and tagged Adam Smith, Aeschylus, Charles Darwin, Great Books, Henry Fielding, John Locke, Thomas Aquinas. Bookmark the permalink.